Pretty sweet huh! And SUPER easy! Keep reading for the tutorial(s). 1. 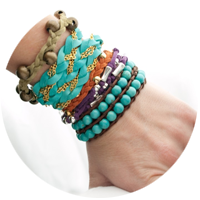 The Beaded Leather Wrap Bracelet: This is the most common wrap bracelet I’ve seen floating around online. I made mine using these FABULOUS tutorials: this blog, Rings and Things, and this video from AuntiesBeads.com. 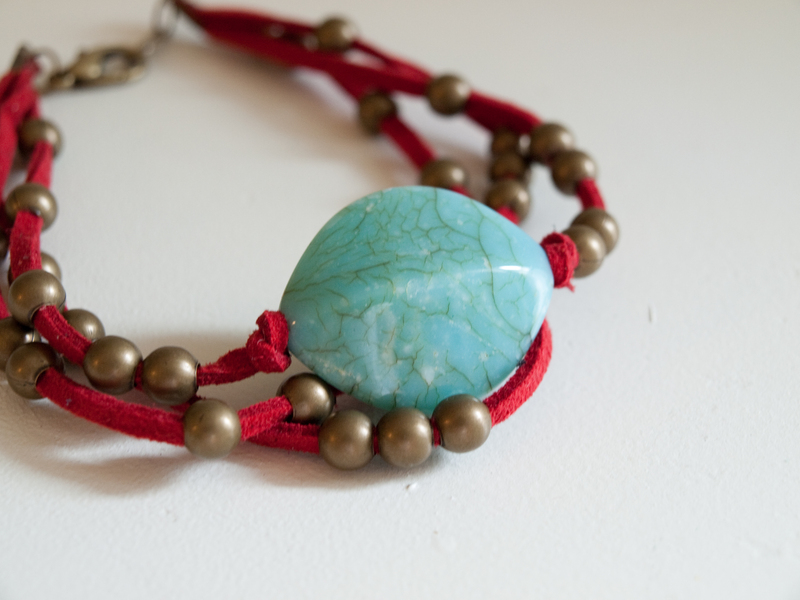 I used what I had at home so I ended up using brown embroidery floss and turquoise round beads. I LOVE how it turned out and it was super easy to make. You’ll quickly become addicted to this technique and will want to make one in every combination. 2. 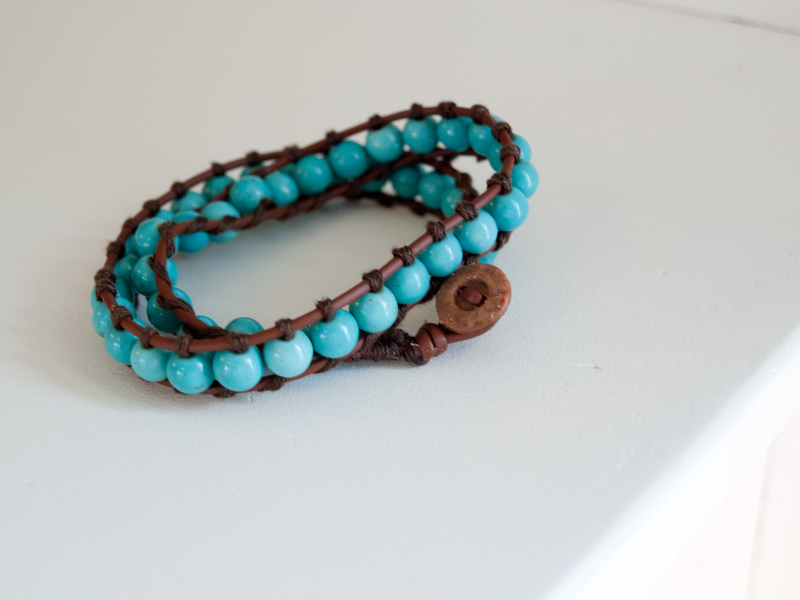 The Multistrand Beaded Leather Bracelet: This one is super easy as well. Well really they all are! 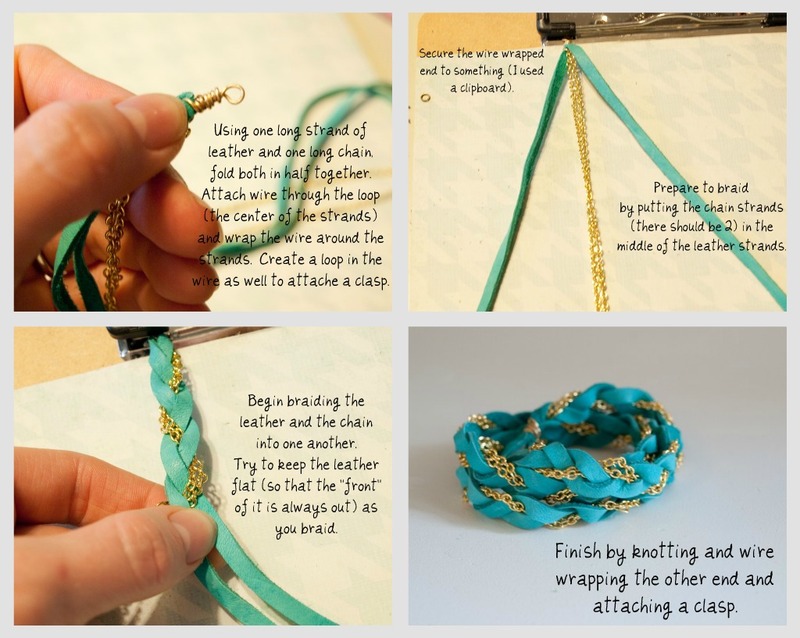 for this you need 3 strands of suede lace, a couple of crimp endings, a clasp of some kind, and beads that have a hole big enough to slide them onto the suede lace. 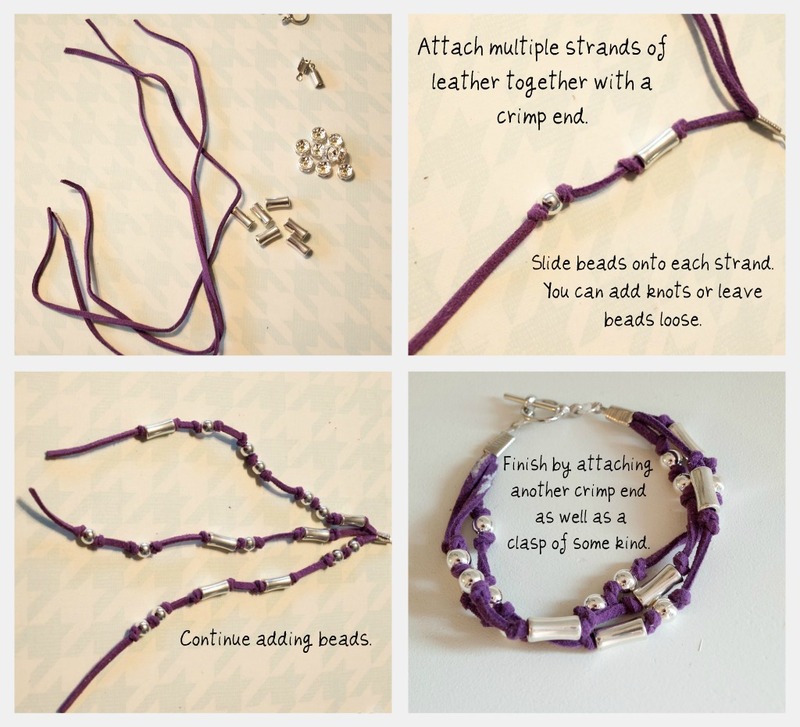 Here are a couple more done similar ways as the purple one above. 3. 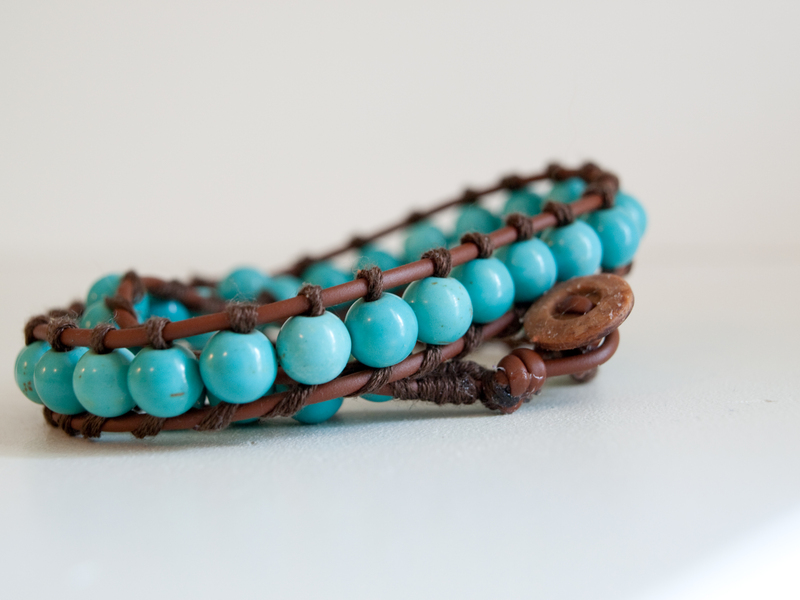 The Braided Leather Beaded Wrap Bracelet: These can be made to wrap just once or made really long to wrap around multiple times. 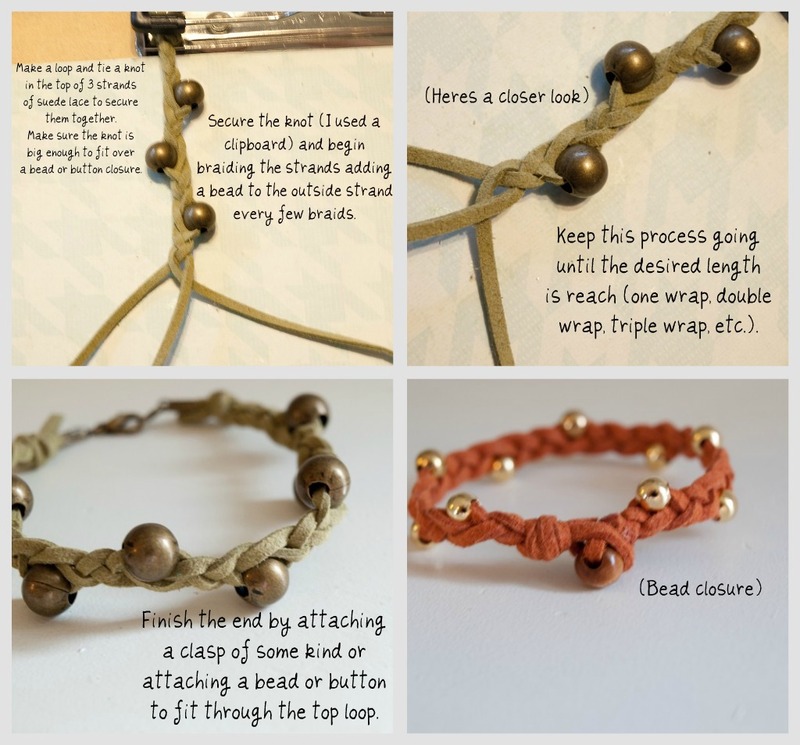 This is a really simple process of just braiding leather suede lace and adding a bead to the outside strap every few braids. 4. 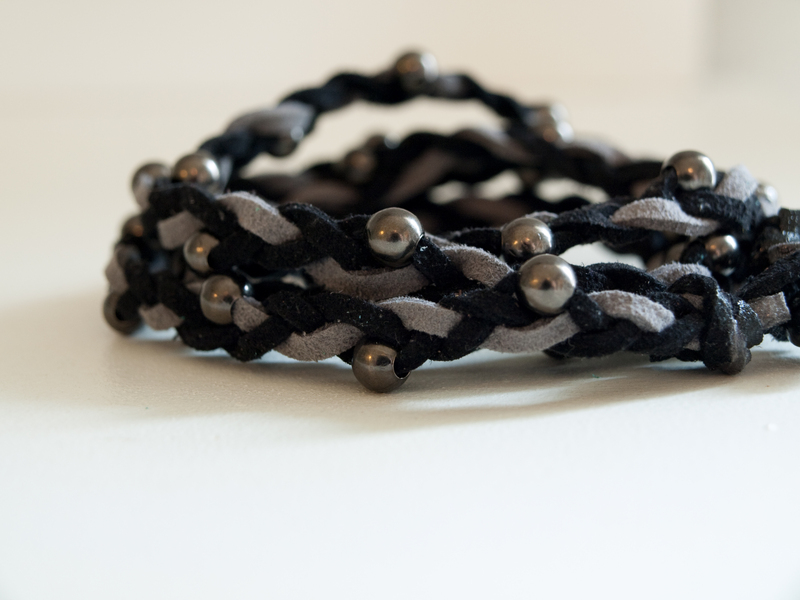 The Braided Leather and Chain Wrap Bracelet: This one is my favorite I think. 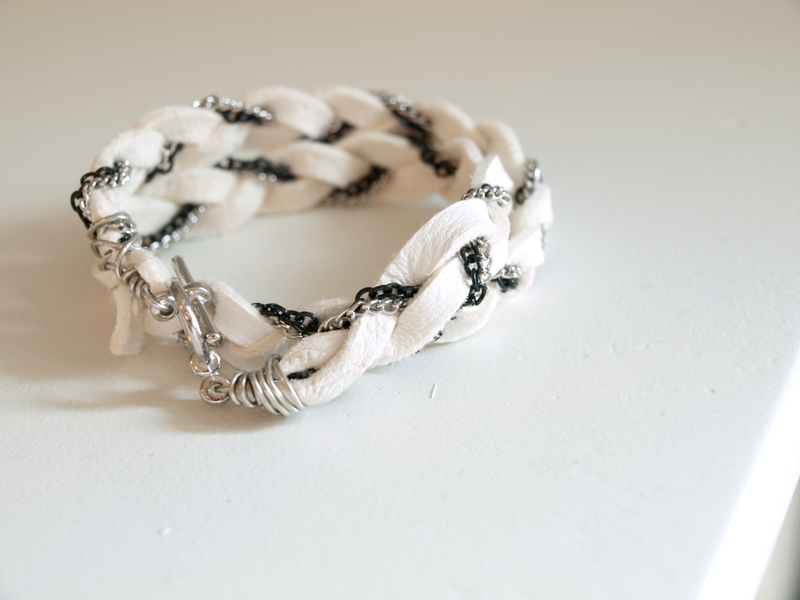 Same story as above, braided leather, but this time I threw in some chain as well to glam it up a bit. 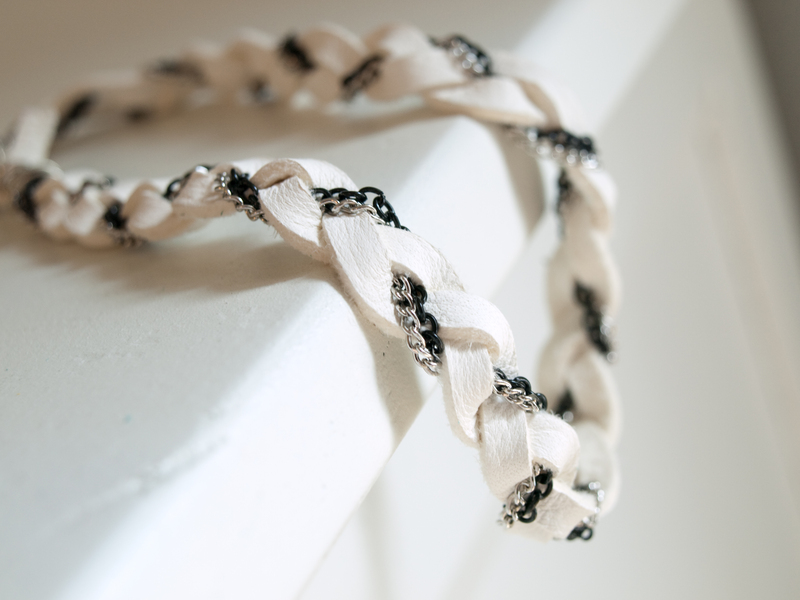 I also used super soft deerskin lace. Also, I used wire to create a loop closure and attach a clasp to. 5. 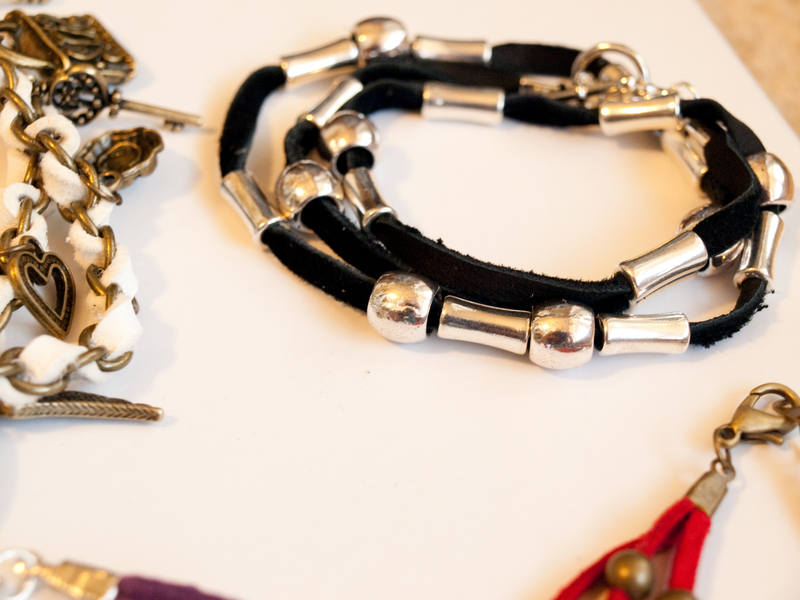 The Leather Weave Chain Wrap Bracelet with Charms: This is another fav. 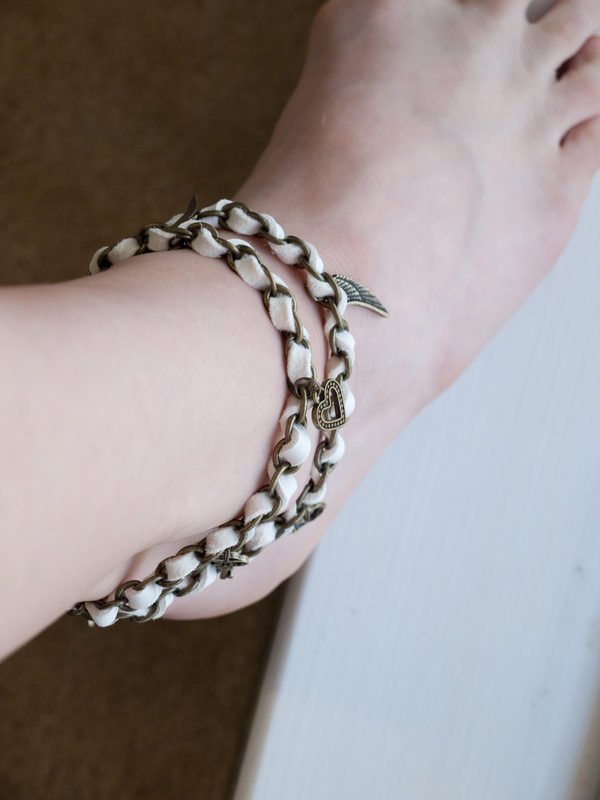 This time all I did was secure a single deerskin leather strap onto the end of a wide chain with a little bit of super glue and then I wove the leather in and out of each link in the chain. Easy peasy. And then of course I simply attached some funky charms. Look for the one above as well as some others I’ve made in my Etsy shop! Happy creating everyone! :) Come back soon for more great tuts and don’t forget to tell your friends! I love every single one of your ideas! I am 18 and getting back into jewelry making after some time off due to low inspiration. Your blog has helped greatly! I am starting university in the fall, and have decided to begin selling my works. 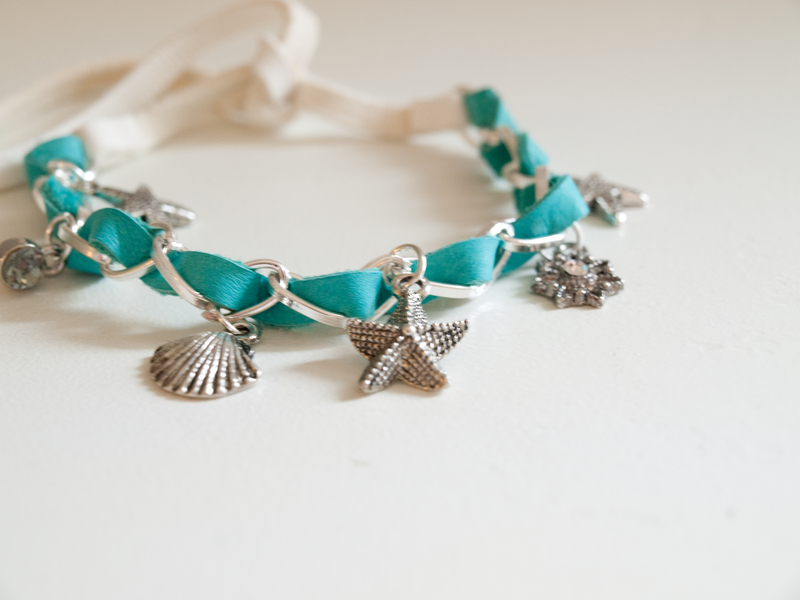 Im wondering if you have any tip or ideas for someone just beginning to sell online? How have you become so successful? I love you work very much. Syd, I’m so glad you liked my jewelry! As for selling online, I’m definitely no expert and I wouldn’t by any means say that I’m a “successful” seller. I sell only a few items a month (but I’m also not putting in a ton of time to it, so its not to say that one couldn’t become successful selling the crafts online). My best advice to you is get yourself and Etsy shop and study their selling tips and tricks. 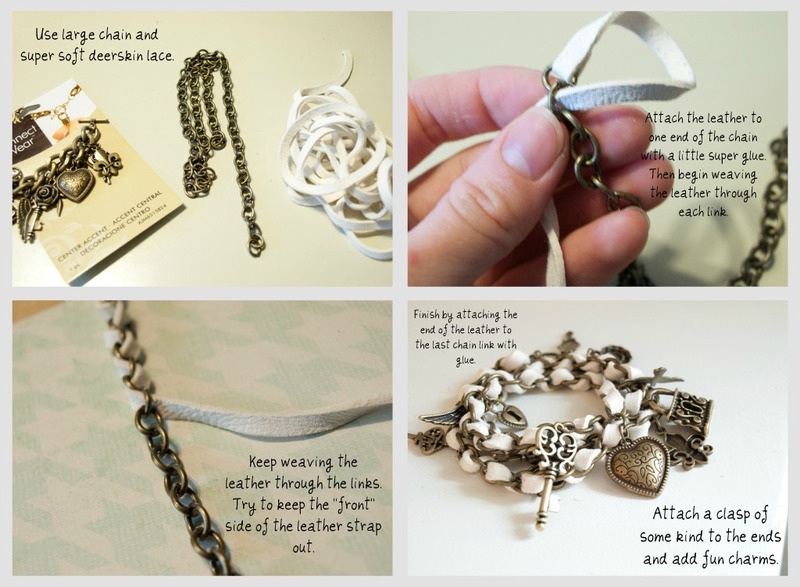 They have a lot of great info on how to become successful selling through Etsy. Good luck! 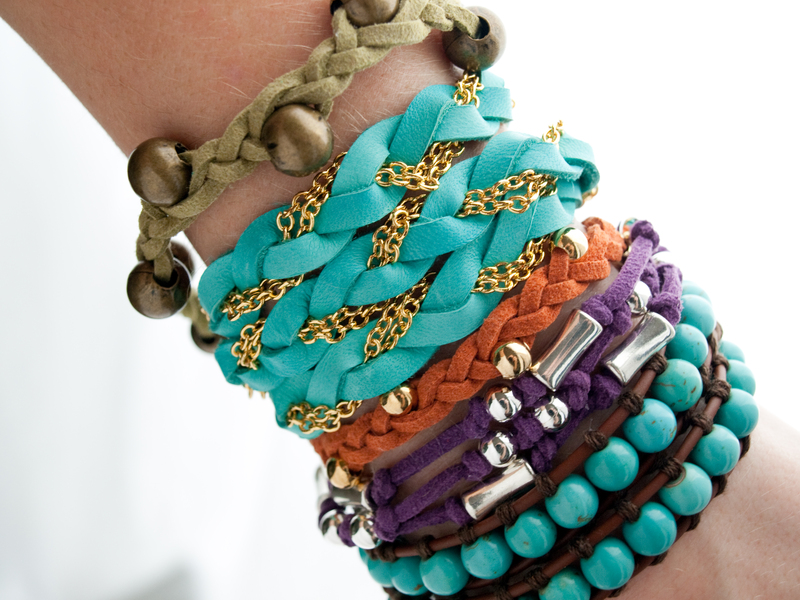 I was wondering where you get the leather for making the bracelets? 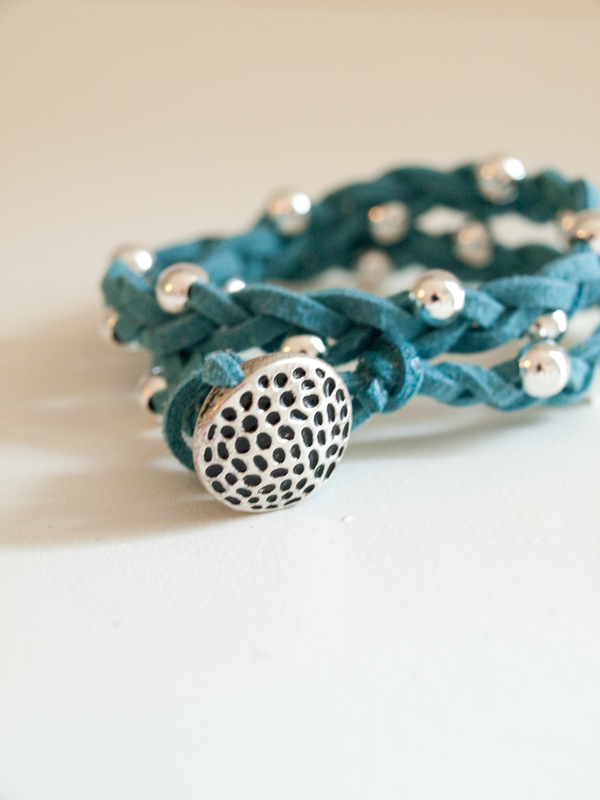 And if you knew where I could get the leather band to put a charm connector type thing in it. Thanks! I find most of my jewelry supplies at Michaels and Hobby Lobby.